Him: It definitely revived my faith. Getting married in the Catholic Church is something that is very important to me and these classes just reaffirmed all my beliefs as to why getting married in the Catholic Church is the right decision for us. Her: I appreciated that I was able to discuss things at my own pace with my fiancé.It revived my faith because it reminded me how important the values of the Church are in the sacrament of marriage and how important a role that faith plays in relationships and building a family. Both: t definitely helped improve our communication skills and open up a whole new dialogue.Thank you for a wonderful experience. Him: Overall it was good. I feel as a couple we learned new things and opened a new line of communication on things we were already working on together. I do feel we have become closer as a couple due to subjects discussed throughout the courses. 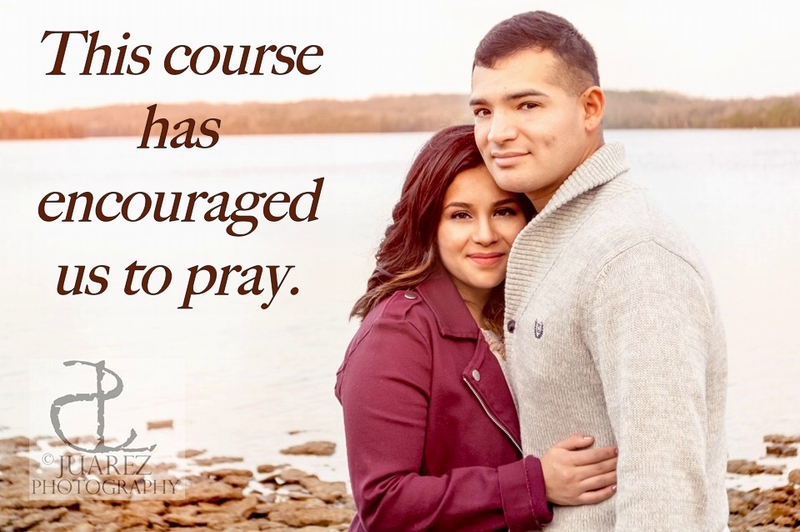 Her: I appreciated the fact that it gave us a clear view of the work we had already done to prepare for marriage.It reminded me of how to fully trust in God and that we can put everything with him. Both: It forced us to communicate in depth on subjects previously not thought of by her or myself and allowed us to talk more in depth on subjects that we have discussed before Marriage Prep. Him: It has encouraged us to pray on an evening basis, and also when times are very tough. Communication is something we've struggled with before, and though we're much better now, we are always looking to improve. Her: I loved it. Honestly, it is so different being married civilly vs in the Catholic Church, so we had a lot of learning to do. I thought the readings, links, resources were all really helpful. And questions were thought provoking! Both: It is truly special to be married in the Catholic Church, and I realize how serious and reverent this next step is! Him: This preparation course far exceeded my expectation. I liked the course and its materials. I felt that it was relevant to our relationship. It brought me closer to my faith and to Kimi. Because of this course, I made a commitment to attend mass every Sunday. Her: I liked the course very much and I believed it brought me closer to understanding the sacrament of marriage and my role in my relationship. Both: It allowed Dan and I to understand that marriage is not only about us. It is about God and his love through us. That communication with God and each other is important and central to marriage. Also that we are on the same team and with God we are "dealing" with the challenges together as they arise. Him: I thought it was very though provoking and sparked good dialogue between Arielle and myself. It provided me with a lot of information that I did not know much about. Both: We really enjoyed the active listening and "I" statements.